After that, we dropped on down to Aztec, NM, where we stayed at the Enchantment Lodge, (10/15) a dinky but tidy and clean motel. It was fun to come back to our motel at night from dinner and see the huge red neon sign high in the air, that stated simply, ENCHANTMENT. That evening, we watched the A's lose their final game to the Yankees. Fortunately, we had other things to occupy our lives than baseball and the fate of the A's, like the Aztec Ruins, another Pueblo ruin, this one with a totally restored Great Kiva, a round meeting place building that rivals some of the older churches in Europe. The 'Aztec' label is another misnomer: the early white settlers decided that only a higher form civilization like the Aztecs could have produced such an extensive village complex, and again, the name has stuck. This ruin contains the remains of a large village with an outer wall with only one narrow entrance. It must have been several stories high. Many of the rooms were in good shape and clearly defined. 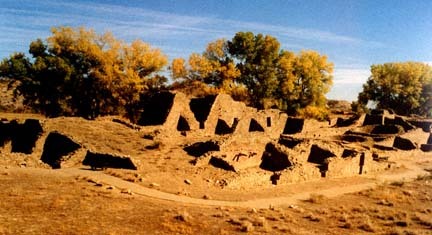 There was a central plaza area near the kiva. Most of the attention in the excavation had been lavished on the Great Kiva, which was indeed very worth seeing, a minor marvel. The base of the walls is painted an oxblood red, a color still favored with local Indians like the Navajo, who favor pick-up trucks of that hue. A great deal of excavation has been done at this site, and it was possible to crawl inside the ruins and examine the individual ruins. Door ways and entrances were very low, generally, and we had to get down on hands and knees to crawl through. -- After a nice morning at the ruins, we went to town to look around. Just the kind of small town I'd like to live. I got a nice short haircut from Deb at the barber shop on Aztec's main drag. Deb recommended the Highway Grill for lunch, which turned out to be very good indeed. We liked this little town of Aztec, which was getting ready for its Halloween celebration. A local newspaper featured a regular column by the Police Chief. We learned from Deb that the town does a great deal for its kids, like take up collections that gives every kid in town a bicycle helmet. Stomachs happy, we moved on south to Chaco Canyon, listening to KNDN - "All Navajo all the time" - a radio station out of Farmington NM. We understood only the car ads and an occasional squib in English, and words like 'Chapter House' that announced an upcoming meeting. Apparently, KNDN has a range of about 40 miles, and is very popular with the Navajo, who depend on it for announcements. It plays an important role in keeping these people, who live many miles away from one another, together. Someone will call the radio station for instance, and tell them that they need their mother to call them up, and that will go out on the air. -- Very few Navajo have electricity or TV, but they do have portable radios and cell phones. Country western music is part of the standard fare as well. At Chaco Canyon (10/16) there were more ruins to see, these quite extensive, many of them excavated and restored by the Smithsonian Institution some decades ago. Restoration, we learned en route, is no longer practiced. Agencies, authorities and scientists are listening to the Indians, who insist that the traces that are left of their ancestors be left as they are, a part of the macrocosm that surrounds them. Chaco's ruins are quite large and impressive, sprawled through an enormous landscape. Here we drove and hiked and photographed. At Chaco, we began to round out our image of the Indians who lived there. They created here the largest set of villages we were to see. At many sites there was pottery lying about, so much so that we wondered about this. Later, we learned that the people here broke pottery as a symbolic act: an object was returned to its source, was no longer part of the living world, had moved on to the realm of the nether world. There were wonderful views in a 360 degree landscape, a fact that the inhabitants put to good use. Apparently almost all of the buildings at Chaco Canyon were built to align with celestial events, the summer and winter solstice, and moon positions as well. There is a large road leading to a chasm to the north. The remains make this clear that Chaco was a site built to express the cosmological view of its builders, though only traces of the inhabitants wider beliefs can be inferred from the tales of their progeny on the Rio Grande and the Hopi Mesas. We paid a price at Chaco, as do all visitors: the road consists of about 24 miles of washboard, at times you can do twenty, for a few moments thirty mph, but for the most part, it was five mph, a rough hour's drive, much of it a suspension-breaking, bone-crushing ride to the highway.